Last week someone at work suggested we “do something for Halloween”. After some debate it was decided that we would hold a competition to determine the most creative team. 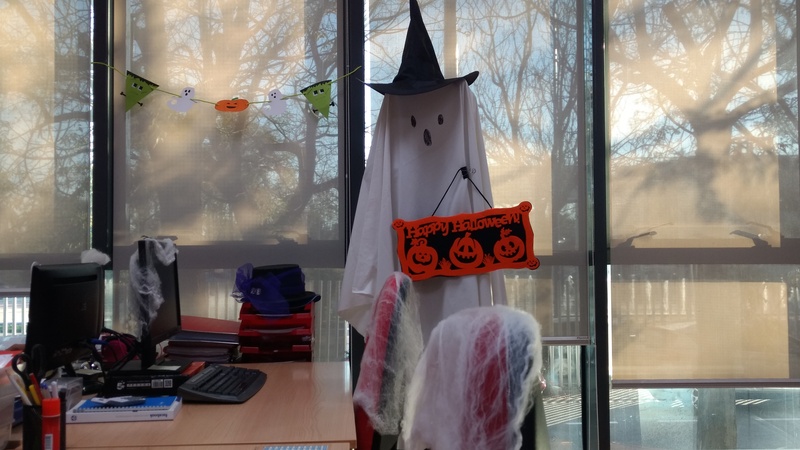 Everyone would have to decorate their work space following a spooky theme and the best design would win. 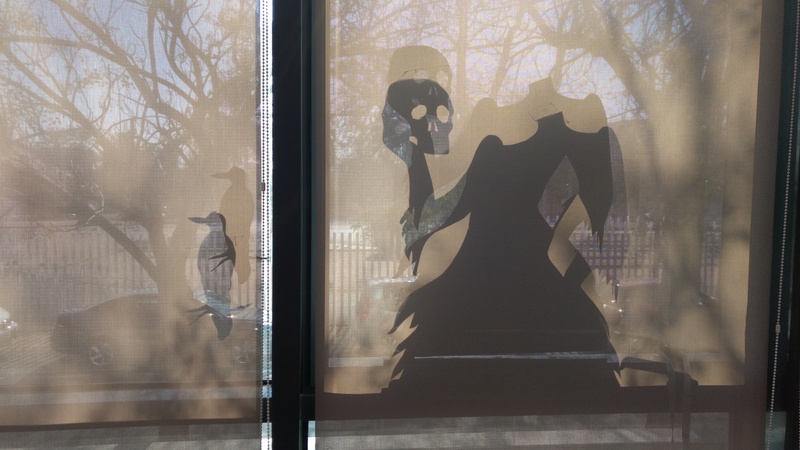 Suddenly our office was covered in ghosts, bats, zombies and monsters. 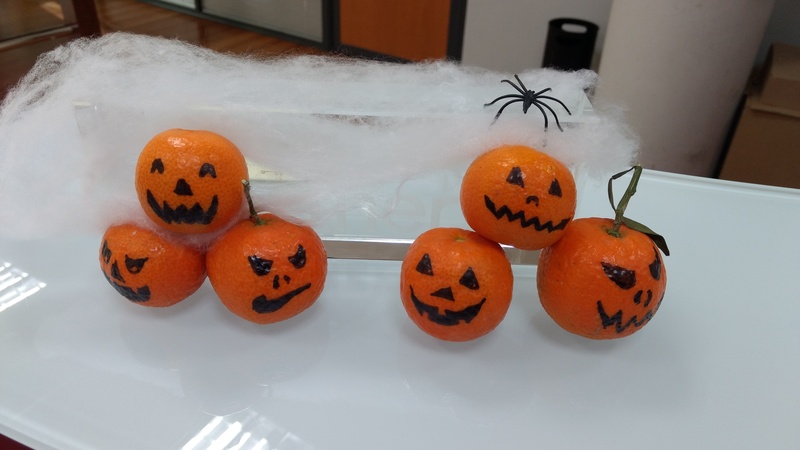 Pumpkins sprouted on the desks and bright crime scene tape covered the coat rack. As the week progressed competitivity increased and we were all curious as to what we would find when we walked through the door each morning. What would they come up with next? When I was a kid, this would have been unthinkable. 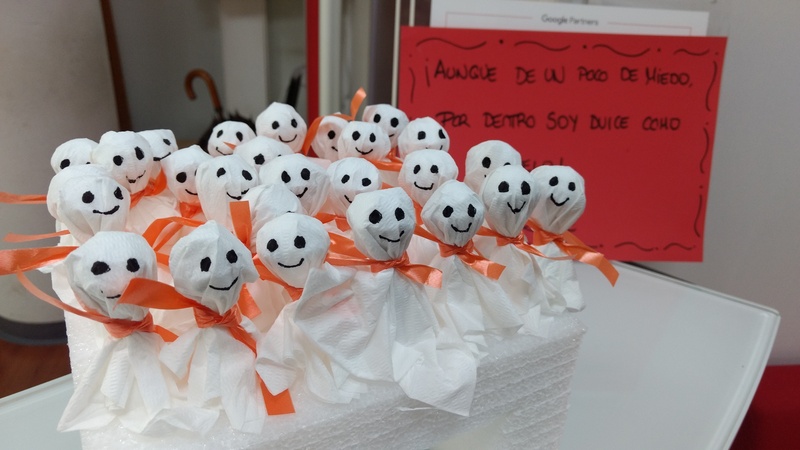 Halloween in Spain was just about non-existent. Then, it started popping up in English classes, a useful resource for teachers who couldn’t think of any other interesting topics to discuss in class that month. Year after year, people became familiar with the concept of Halloween and started asking us about it. “Nah, that’s an American thing”, we’d say. “Nothing to do with us”. They didn’t seem to grasp this, however, and the questions kept coming. Jump forward a few more years and you’d actually get a few kids knocking on your door and saying “Trick or treat?” with a cheeky grin. At this point mum might sigh and rummage through the kitchen cupboard in search of some sweets or chocolate, handing it out apologetically and adding “we don’t actually celebrate Halloween”. Anyway, the years passed and here we are, Halloween has become a full fledged commercial event, another excuse to sell cheap merchandise. Plus, you know, any excuse for a party! That’s not to say that Spain doesn’t join in with spooky festivities around this date. We even have a bank holiday. The 1st of November is known as Día de todos los Santos or All saints day. Traditionally it is a day to remember loved ones who have passed away. Many people visit the cemetery on this date and take flowers to loved ones’ graves. Another particular tradition involves the tale of Don Juan Tenorio. This play by José Zorrilla was published in 1844 and tells the story of Don Juan Tenorio and Doña Inés de Ulloa. It goes something like this. Two friends, Don Juan Tenorio and Don Luis Mejía, held a bet to see who could fight the most duels and woo the most women over the course of a year. The play starts when they reunite 365 days later and find Don Juan to be the victor. As the conversation and bravado continues, the rivalry between the friends escalates, the authorities are alerted and news of the scandalous bet spreads throughout Seville, were the action takes place. Determined to marry the young Doña Inés, Don Juan, bets he will woo her still… and also sway Don Luis’s fiance away from him and towards himself. Don Juan manages to bribe his way into the nunnery where Doña Inés has lived her entire life and whisks her away to his estate. Events escalate and part one ends with Don Juan escaping on a ship to Italy, leaving a heartbroken Doña Inés. Five years later he returns to Seville, only to find a graveyard where his father’s palace once stood and he comes face to face with his own death and eternal destiny. The second part is the main reason Don Juan Tenorio is performed so frequently on this date, since ghostly appearances feature heavily towards the end of the tale. Don Juan Tenorio isn’t the only literary work based on the myth of Don Juan, but it is the most performed during the run up to “Halloween” in Spain and, especially, Seville. What do you get up to for Halloween? Do you celebrate it?